In Houston, “College Night” is a phrase typically seen on nightclub ads luring students with cheap drinks. Last week, the Museum of Fine Arts, Houston held a college night of its own, inviting students to tour the museum for a discounted price of $10. Welcoming young Houstonians to the MFAH were the synths and bass snarls of DJ Johnny J, back in Houston after playing SXSW. The main draw for many of the students was the chance to see two widely-advertised exhibits, Picasso Black and White and Portrait of Spain: Masterpieces from the Prado, at the discounted price of $10. (Students tickets are normally $17). Free admission was offered to students at Rice, the University of Houston School of Art, the University of Houston–Downtown Department of Arts and Humanities, and The Glassell School of Art. In the lobby of the Audrey Jones Beck Building, people gathered around mint-colored tables and Instagrammed photos of each other as they ate gourmet grilled cheese sandwiches and desserts from the on-site food trucks. 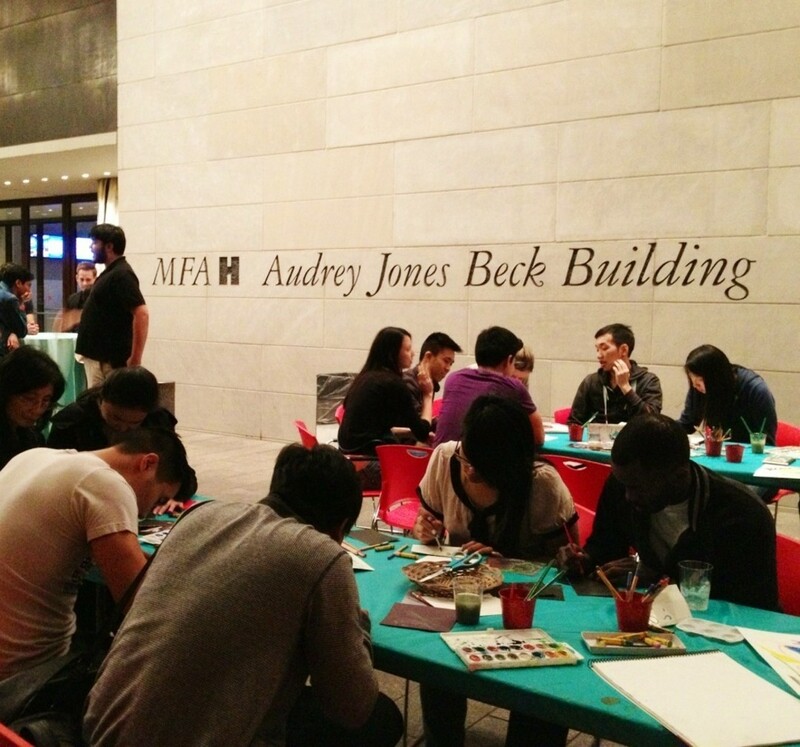 Other students sat around long tables brimming with paper and watercolors provided by the MFAH, creating their own works of art. There was a larger crowd at the Prado exhibit, with many students sharing amused or quizzical looks in front of a series of paintings featuring dwarves and buffoons employed by the Spanish royal court.